(16/47) TRENTON – The New Jersey Division of Parks and Forestry is targeting state-owned lands in at least nine counties for aggressive emerald ash borer prevention measures in a comprehensive effort to stem the spread of the destructive insect and protect the beauty and health of wooded landscapes, Department of Environmental Protection Commissioner Bob Martin announced today. DEP foresters are working with the New Jersey Department of Agriculture, U.S. Department of Agriculture and Rutgers University as part of the New Jersey Emerald Ash Borer Task Force, which is coordinating efforts with municipalities and counties to protect trees on state lands and communities that surround them. “The Emerald Ash Borer Task Force has proactively worked for the last two years to raise awareness of the threat to New Jersey ash trees from the emerald ash borer,” said New Jersey Secretary of Agriculture Douglas H. Fisher. New Jersey’s population of ash trees is estimated at 24.7 million and they are a significant component of the state’s landscape, making up nearly a quarter of New Jersey’s forested lands. The greatest numbers of ash trees are found in central and northern New Jersey. The DEP’s prevention efforts on state lands consists of aggressive monitoring through traps, ground and aerial surveillance, and targeted pesticide treatment to prevent infestation in vulnerable areas threatened by spread of the invasive insect, a native of Asia. The locations targeted for these efforts include Liberty State Park, Hudson County; Round Valley Recreation Area, Hunterdon County; Hermitage Museum, Bergen County; Ringwood State Park, Passaic County; Delaware & Raritan Canal State Park, Somerset, Middlesex and Mercer counties; Swartswood State Park, Sussex County; Hopatcong State Park, Morris County; and Washington Crossing State Park, Mercer County. Foresters have checked ash trees in these areas and found them to be in good health. But without treatment, the trees would be susceptible to infestation from emerald ash borers, which the U.S. Department of Agriculture calls a “significant threat to our urban, suburban, and rural forests.” Infestation can kill a tree in three years. 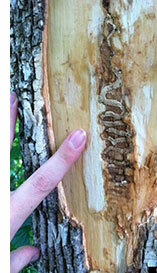 The emerald ash borer is currently active in 14 towns in six counties: Hillsdale, Bergen County; Edgewater Park and Westampton, Burlington County; Ewing, Hamilton Township, Hopewell, Princeton, West Windsor, Mercer County; Monroe and South Brunswick, Middlesex County; Bridgewater, Franklin Township and Hillsborough, Somerset County; and Allentown, Monmouth County. The Department of Agriculture this week began its trapping program, placing purple, sticky traps in areas surrounding those where EAB is active. The Department is seeking volunteers for trap placement this year. If interested, please call Joseph Zoltowski at 609-406-6939. In addition, in an effort to protect the state’s ash trees, the Department of Agriculture this week began a program to release biocontrol parasitoids for EAB in areas of Mercer and Somerset counties. Releases will be made every two weeks throughout the beetle’s active season. The Department of Agriculture confirmed the state’s first emerald ash borer infestation in Bridgewater Township, Somerset County in 2014. By fall of 2015, infestations were also found in Bergen, Burlington, Mercer, Middlesex, and Monmouth counties. The tiny beetle, smaller than a penny and with metallic-green wings, was first discovered in the United States in 2002, in Michigan. Since then, the beetle has killed hundreds of millions of ash trees in North America, with some of the heaviest losses in the Midwest and Southeast. 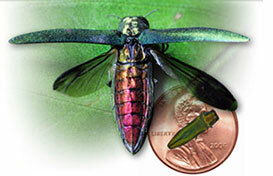 Ash trees can be infested by the emerald ash borer years before the tree begins to show symptoms of infestation, which begins when female beetles lay eggs on the bark of ash trees. The eggs hatch and larvae bore into the bark to vessels underneath that carry fluid. As the larvae feed and develop, they cut off the flow of nutrients, eventually killing the tree within three to five years. Symptoms of infestation include canopy dieback, woodpecker activity, missing bark, D-shaped exit holes, shoots sprouting from the trunk, and S-shaped larval galleries under the bark. If an ash tree is already infested or in poor health, it may be best to remove the tree before it poses a hazard to people and surrounding structures, Sacco said. Communities, businesses and residents with high-value, healthy ash trees can treat the trees before any infestation occurs. Anyone who sees emerald ash borer or suspected evidence of tree damage is urged to call the New Jersey Department of Agriculture as soon as possible at (609) 406-6939 or a DEP forest health specialist at (609) 984-3861. A Certified Tree Expert can help evaluate, treat or remove impacted ash trees. Call the Board of Certified Tree Experts at (732) 833-0325 or e-mail njtreeexperts@gmail.com for a list of tree professionals serving your area. As part of its coordinated effort with towns and counties, DEP has provided an Action Kit with printable materials, templates, and other guidance for managing ash trees.